I've always been comfortable enough in small spaces, so the concept of capsule hotels really intrigued me when I first prepared to move to Japan. I looked up information on the Internet about where I might be able to find capsule hotels around Osaka and Tokyo for my (envisioned) many nights out on the town! As it so happened, I was too much of a cheapskate to stay out overnight often when I could make the last train home, but I did have the chance to try out a few capsules while in Japan. A capsule hotel is just a place to lay your head - you're trading space and amenities for the price, which is usually in the $30 USD/CAD range. I often stayed at the above hotel (Capsule Hotel Asahiplaza Shinsaibashi) in Osaka during the nights between the JET Mid-Year Seminar, a training session held over three days more than an hour away from my apartment. The cost of the hotel (¥2,900) was more than worth saving the 3 hours of travel time heading home after a long day and then back to Abiko first thing in the morning - not to mention the ¥600+ yen each way in train fare. 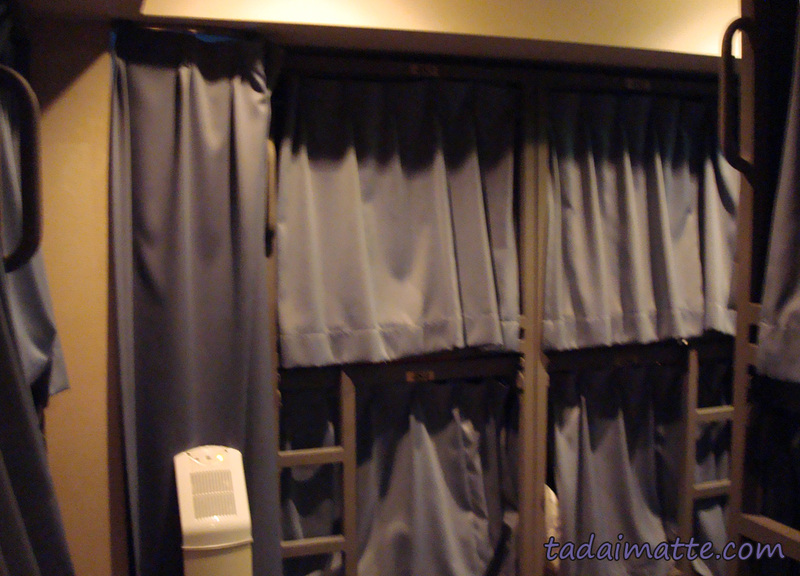 Most capsule hotels do not accept women, and this was one of two that I was aware of in Osaka that did. In fact, I'm told that the womens' floor (sealed off with a lock to prevent intrusion) at Asahiplaza Shinsaibashiwas much nicer than the mens', and with less snoring. The beds that you see in the photo above are stacked two units high and luggage is kept in a separate locker. In the womens' area, there was a public bath, sauna, television room and reading lounge. Guests are provided with pajamas and towels, and the bathing area has toothbrushes, brushes and combs kept in a sterilizer, hair dryers, lotions, Q-tips, make-up sponges and a few other disposables. Most hotels have a few mainstays built into their capsules - usually a television, radio and alarm clock are standard; the Shinsaibashi hotel also had an interior fan and some shelves. Each time I visited, I made sure to take advantage of the beautiful baths at this hotel. I wasn't sure I could manage it for the first time if someone else was in the bathing room, since it was still very early on in my stay and I was nervous at being the only foreigner there. I was alone when I stowed my clothes in the bathing room lockers and managed to almost finish washing my hair before another guest, a lady in her mid-40s, came in and started to shower. She didn't even give me a second look. so after a moment my awkward feeling passed and that was that. That first bath was amazing. I had not yet been to Spa World, and this was a whole different beast anyway; it was more of a sento (neighbourhood bath) environment. The shampoo, rinse and soap from the showers smelled gorgeous, too, and after relaxing in the bath (which was made out of black marble) I went to the sauna to dry off. They had everything I could have needed to make myself comfortable for the night and the nervousness had entirely passed. That evening's sleep was very, very comfortable. Most capsules are really pretty standard, though some, like Kyoto's 9 hours, really take it to the next level. Over the next few years I tried out a few capsule hotels in Tokyo as well, including some off-the-beaten-path choices like the womens'-only VIVI Roppongi one weekend when I had taken the Seishun 18 to Tokyo on a whim and didn't have a single toiletry with me except the contents of my purse. I still regret not taking good photos of that place, since it was really fantastic. It was my first time going to Roppongi, and I was rather disappointed by the area, sadly. VIVI was great, especially the rock sauna, but the next few times I visited Tokyo on a whim back I ended up back at my favourite cafe in Shibuya. I also stayed at the Green Plaza Shinjuku once, but their facilities weren't worth the price in comparison. 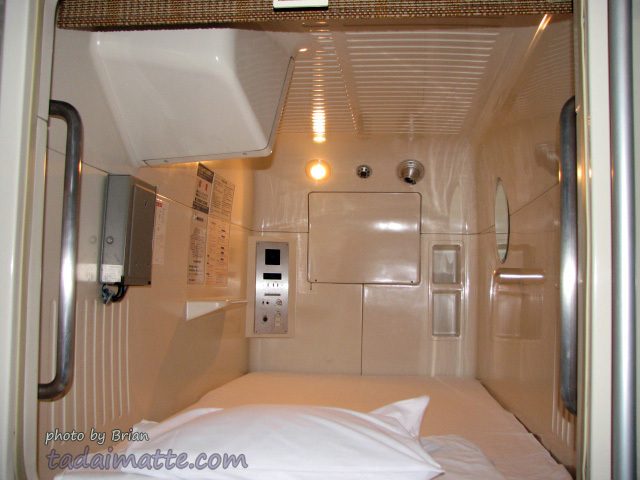 It just wasn't as nice as my capsule hotel in Osaka or as the capsule beds at Khaosan in Asakusa. I still regret not getting to stay in a tatami capsule at Capsule Ryokan Kyoto. Next time, Japan! !